Although my age (19) means that I'm still technically a teenager, it doesn’t feel like it. I think of my ‘teen years’ as really being between about 12 and 16 - but how that interval is defined differs for each individual. I think I was always desperate to escape the label; move beyond the associations of secondary school. Throughout this time, I can’t really think of a singular role model or celebrity I really admired – at least, none that were current (or alive). I adored Audrey, dabbled with Marilyn, discovered Grace Kelly, and had a soft spot for Moira Shearer in The Red Shoes. These were adult women – glamorous, well dressed, clad in technicolour. Others were on the periphery. Kate Bush and Twiggy come to mind. But were there contemporary women, particularly younger ones, who I also admired? I can’t think of any. However, maybe that’s because there was no one like Lorde around at that point. Or, if there was, I didn't know of them. Instead of seeking out new bright young things, I was stuck into The Beatles and David Bowie. That lack of knowledge may be partly due to the way in which communication and visibility have changed. I was perhaps among the last generation of teens who didn’t have the means to follow celebrities or musicians ardently on Twitter or to scroll through their Instagram posts. That level of access, the semblance of an insight into the lives of these profile names, is still so new. The relationship between celebrities and the internet is a subject explored by many elsewhere. The point here is that I wish I'd stumbled across a figure like Lorde when I was a few years younger. At a point where I was figuring out my identity, I would have found her both aspirational and affirmative. I’d have loved to see someone still in their teens who was not only successful, but also creatively dressed and very outspoken - someone willing to point out when her spots had been retouched, someone who was discussing the significance of feminism, someone with that keen mix of individuality and intelligence. But here’s the great thing. I can appreciate all those qualities now, and know that there are plenty of teenagers (and adults) who feel the same. I can listen to her music, with those thoughtful lyrics that kind of capture what it’s like being on the cusp of adulthood, the beats catchy enough to dance to around my room. I can get a little bit too excited every time I read an interview with her. For the first proper time in my life, I can admit to being something of a fangirl. One of the things that really cinched my respect for Lorde was this interview on Rookie. Now there’s another platform I so wish I could have been reading when I was 13. I really admire Tavi Gevinson, particularly in her transition from style blogger to professional in a range of fields. Rookie is fantastic in its range of voices, perspectives and experiences. It covers issues that teenage girls actually want to read about (kissing, sexuality, mental health, DIY manicures), but doesn’t have an age limit. Many of the ideas highlighted and written about in Rookie are ones that are relevant long into one’s twenties and beyond. In that talk with Tavi, the combination of these two smart, engaging individuals just having a conversation – unspooling their thoughts on aesthetics and confidence and music – was so refreshing. It made me realize how rare it is to have interviews that are primarily about ideas – and particularly ones interested in what young women think about and feel, rather than which stereotypes they either fit or transcend. Recently I’ve been thinking a lot about teenage girls – for reasons that will become clearer soon. Lots of time has been spent mulling over how they’re portrayed, generalized and written about, as well as what’s significant and pressing for them at the moment. So it’s heartening to see prominent young women like Lorde (and Tavi) who are creative, who speak up, who achieve things - and wear some damn good outfits along the way. 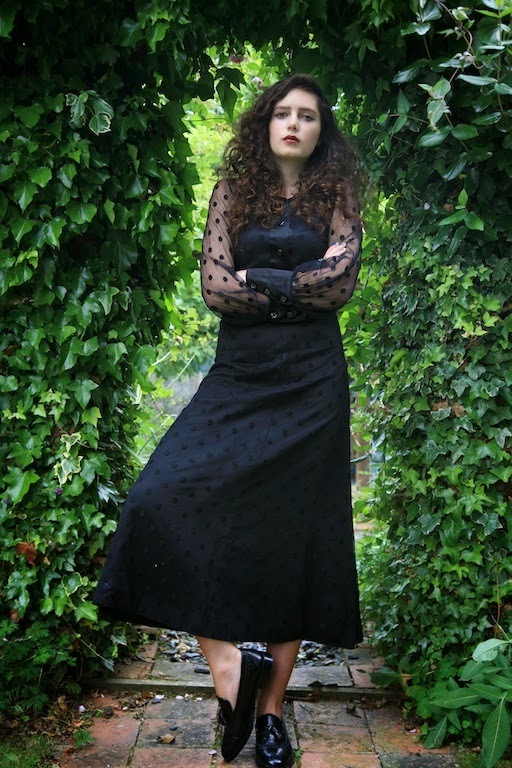 I am dressed, of course, in homage to Lorde - complete with vaguely witchy vibes and flat shoes. 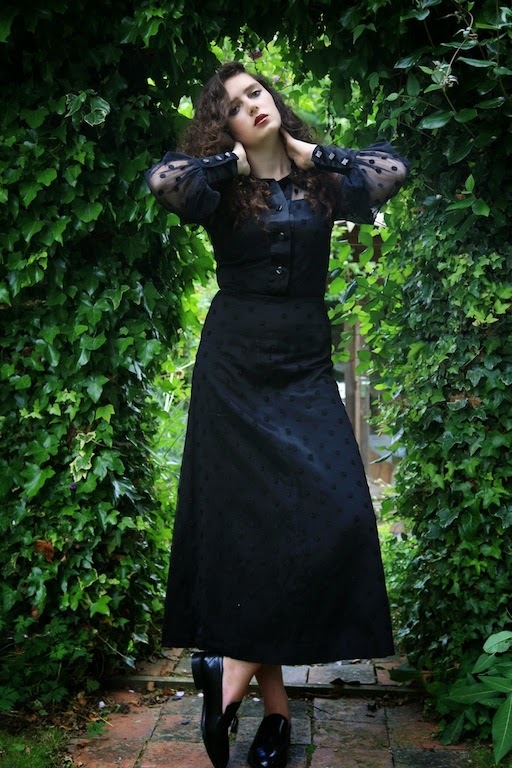 The dress was from Reign vintage in London - I have a real love for the translucent spotty sleeves. The black Bally men's brogue loafers were from a vintage shop. The ring was my mum's. Realised in retrospect that my lipstick was not as purple as I thought it was. "Teenage"...or any age for that matter is all in the mind. Loving the dress....and totally eyeing those brogues! I have been searching for a good pair of brogues since long now....but haven't found a satisfactory pair yet! I think I should look in the Men's section next time!! Those translucent spotty sleeves are divine! 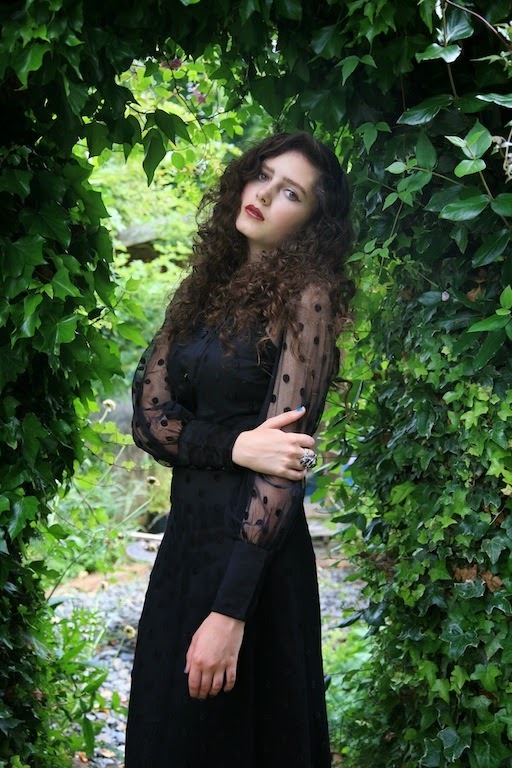 You always have such amazing vintage finds...really this is such a great dress and a lovely homage to Lorde (who I must admit I haven't followed closely... but I do love her voice and the fact she is half Croatian;) I did read most of that linked interview and it did resonate with me. However, life is just life and we go trough different stages and there are no real heads up/ clues/ or indications whatsoever about the future. Now, when I think of it, my life was a lot more organized when I was 19 than it is now...I had a job, I knew (or thought) I knew where I was heading in life...People back then often assumed I was older than I really was...and as a teenager I was often described as being mature. Now, a decade later people assume I'm much younger than I actually am...In many ways I do feel different than I was back then, but not necessarily in a bad way. Perhaps we're just different people at different times in our lives, sometimes for the better sometimes for the worst. Somehow it seems to me that most people like to take a rather linear perspective...I guess it makes them feel more in control of things. I think ageism works both ways. Sometimes the young are seen as not being quite real, which is never good. While it is true that we take more responsibility for others as we age, that responsibility for ourselves begins quite early and it is really important that we grasp the seriousness of it...by that I don't mean that children should act as adults ( I do think they're often forced to become adults sooner than they should be) but that the emotions and views of both children and young should be respected more...it seems that youth like many other things in today's society has become something that is both idolized and condemned (at the same time). I have to put my hands up and admit that I am clueless about celebrities. People often attempt to talk to me about all sorts of famous people and I really don't know who they are. Somehow this has marked me as odd in some people's eyes. I suppose it is not the celebrities but the way that some people/media cover them that makes me feel uneasy and so I learned to block it all out? That said, you have piqued my interest and as I always have my ears open, I shall be listening to some Lorde so I can learn something new. I know the name and have her her on Radio One but don't think I have a clue as to what she looks like. I must go and Google Lorde straight-away. I love those see-thru' spotty sleeves, in fact I love the whole outfit. I've been reading your blog for three years now and I don't think I've commented before, I'm too shy, but I just had to say that I am so happy to have found 'The Vagenda' blog because its absolutely brilliant. Wish I'd known about it earlier! Oh gosh how many times I've had these very thoughts about Lorde! I just turned 24 (not that I feel it at all) and there really wasn't anyone promoting interesting or refreshing opinions during my formative teenage years. I do really remember stumbling on Tavi's blog at the age of 16, and being struck by how she made it cool to be interested in books, music, art, feminism! It marked a very big turning point for me, I realised I didn't have to be a sheep and could dare to be different (cringe but it's true). I only wish there could of been someone like her or Lorde earlier in my teens! Marvellous styling, you look wondeful! 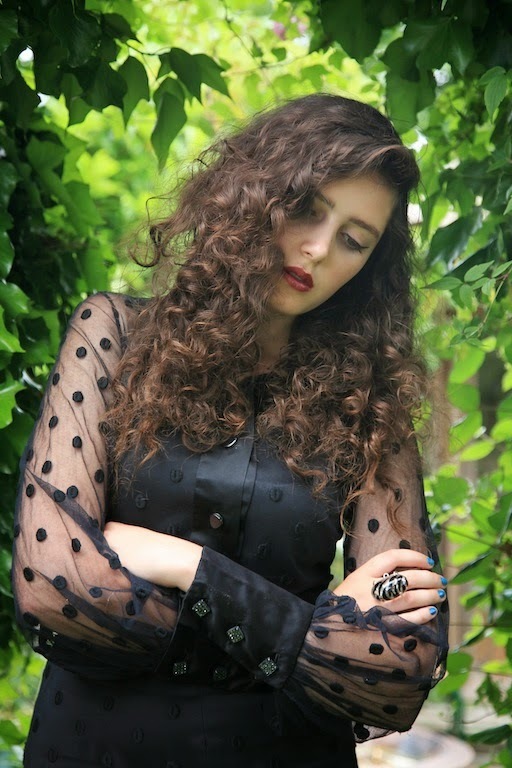 There's a charming mysteriousness about Lorde, suitably paired with her esoteric lyrical style. My boyfriend and I recently saw her in concert and loved the show. I also like what Tavi has done with her blogging/editorial direction. I totally agree with you. I'm also nineteen and I had no similar age role models when in my teens. I wish I discovered Tavi sooner because she's such an inspiration and her Rookie community for teenagers is fantastic. I feel like I missed out, haha. I love the loafers with that dress. Perfect! I must admit that I always look up to people. It could be Gwen Stefani or Herman Hesse, but I felt attracted by their power on their own selves. However, I wasn't a fan girl. I never like to hang posters on the walls or wear music band t-shirts. So when I got to know Tavi Gevinson I admired her personally a lot but I also realized that I was never feeling like a teenager.I was never a fan girl. In fact this years have been the worst years of my life. When I knew less than ever how I am. I always felt older than others in my age. I still feel older. I feel old. I feel that I always prefer the long beard wise men ideal rather than the pop-start. What I want to say is that I'm also really glad that nowadays there is much more interesting women in the world as a model to follow for the younger generations. It also give me the energy to believe that I have something to give them too. Like you also do. You look amazing this time, so dark, so witch, so sober. 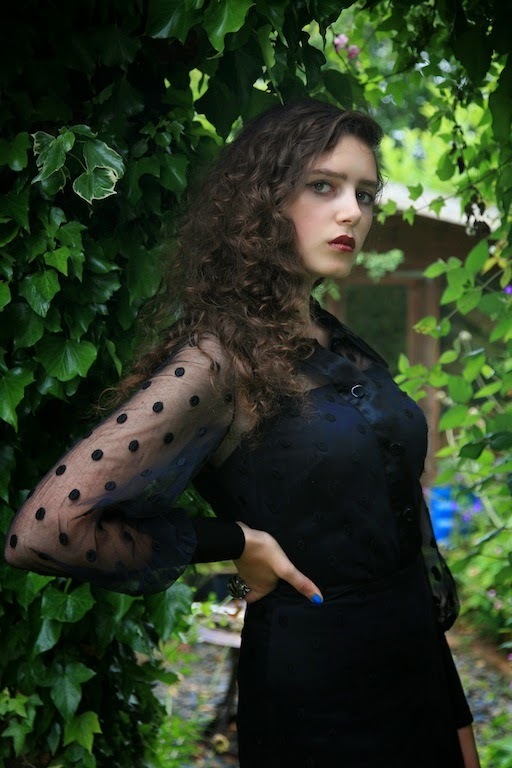 This post really resonated; to have had a role model like Lorde or to have been exposed to the many blogs and online magazines that I do now (at 15) when I was 10-12 - not exactly my teens, but it was definitely the time all that was most needed - would, I think, have saved me from some horrible experiences and quite a lot of unhealthy views about myself. But as you said, we can still value those things now. Lorde is just brilliant - my reverence for her only grows with each song and interview. Tavi is such an amazing young woman as well, I don't visit Rookie enough! Have you ever heard of Birdee(birdeemag.com)? I've only been reading it for a few months, but it's another one of those things that I wish I'd known about earlier. It's a fantastic platform for (mainly) young girls both wanting to read and write articles. It combines politics, make-up, ethical fashion, mental health, feminism, human rights, body image, sexuality, science and all sorts of other wonderful things. Great homage to Lorde - you've really captured her in that second image, I knew you were channeling Lorde when I saw that shot on your instagram, before even reading the caption. 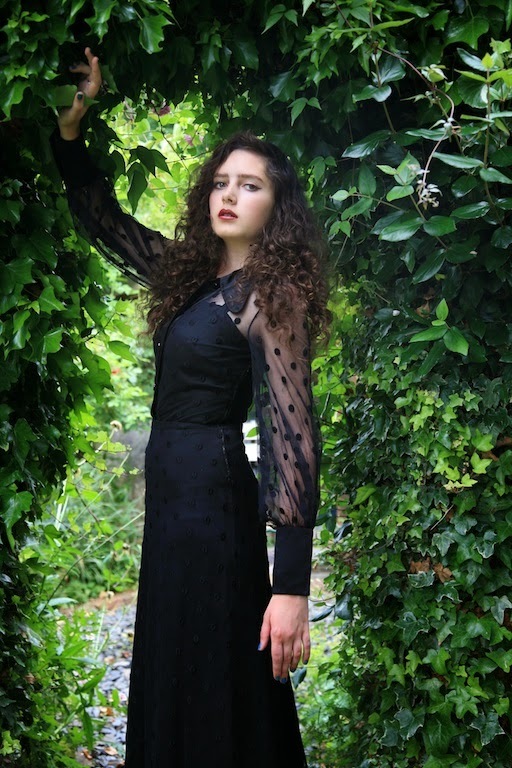 That dress (the SLEEVES, dahling, the SLEEVES)and the brogues are gorgeous, I think Lorde would definitely approve - in fact, I think Lorde would love your whole blog if she found it! Yes, absolutely yes. I read that interview with Tavi you are talking about and it was just perfect. It felt like the kind of music interview I'd always been wanting to read. I was just so impressed with them both, with that fangirl edge existing quite happily alongside really brilliant discussions about culture. I admit, I have some major jealousy for Tavi and how much she has achieved at her age. But I also love so much what she has done with Rookie. I would have read it every day if it had existed when I was a teenager. And I love Lorde so much. She's beautifully self aware and I love the beat poetry edge to her music. I also wish Rookie had been around when I was a teenager. I think the phrase that applies to both you and Lorde is that you're both (from what I've garnered from this blog and the interviews she gives) is that you're wise beyond your years. If we have to have such young celebrities then I hope that more of them are like Lorde and less like the young girls who believe, or are coerced into thinking, that to be successful you need to say what you think other people want to hear and wearing the bare minimum of clothes possible. what a dress and what amazing pics! !